Snow brings out the best in people. Snow doesn’t phase me. I was born and raised in Western New York. My Dad helped my twin sister and I build an igloo in our front yard using nothing but our hands wrapped in cheap mittens and empty 2 liter-sized pop bottles filled with water from the kitchen sink (we made a lot of trips in and out of the house, my mom was not thrilled). Now I am in no way a fan of snow. My car is old and can barely make it up a steep dirt road let alone the slippery unpaved city streets. I get cold even in the blazing heat of summer and I’m much too klutzy to deal with black ice and unsalted steps. Needless to say, brisk Buffalo weather is no fun for me. What I do love, though, as I’m sure everyone does, is witnessing random acts of kindness, especially during a time when there have been so many sick and twisted events happening around the world, and in our very own backyard. A lady on my street couldn’t get her car out. 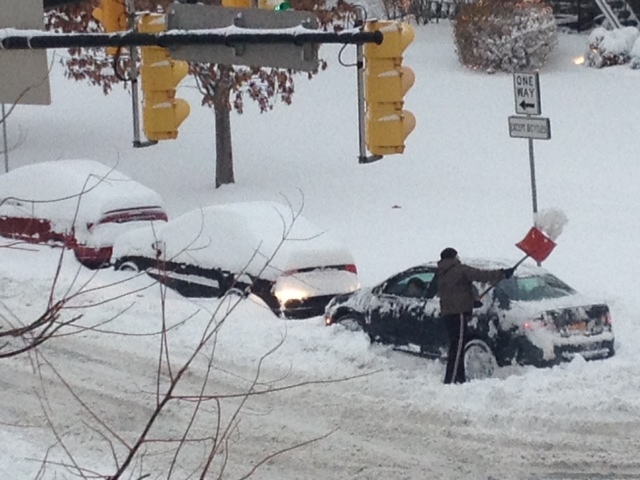 This stranger ran into his house, grabbed a shovel and started digging her out. One heavy scoop of snow at a time. 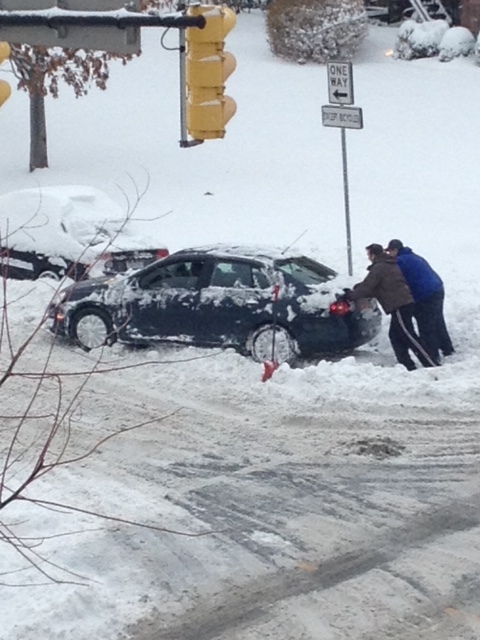 After struggling to push this woman’s car out, a second stranger came to help. 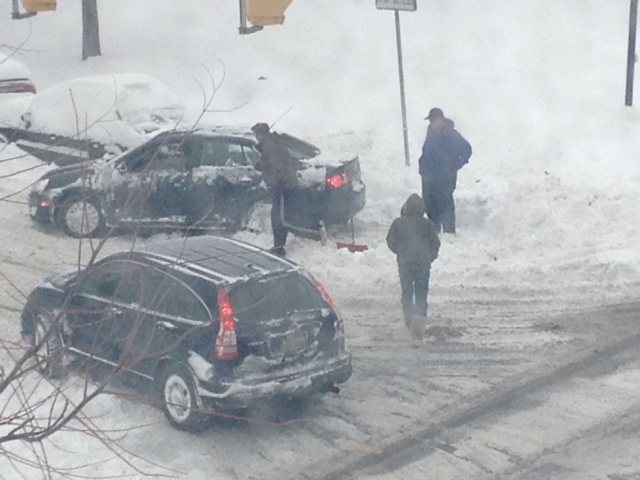 Just when I thought cars were going to continue to pass by these two men struggling to get this woman’s car out, a third stranger hops out of the car to help. 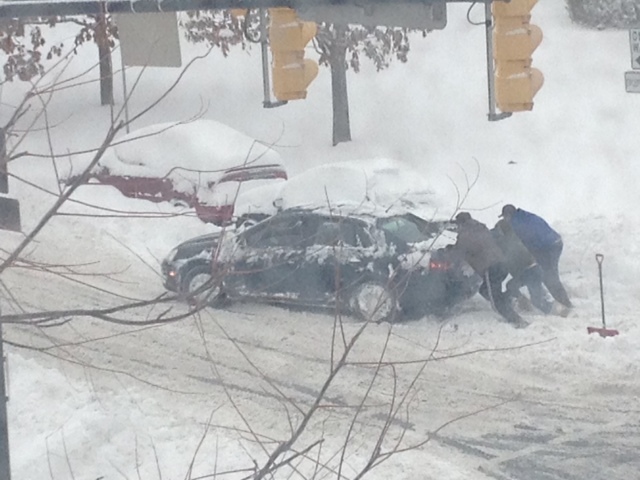 Together, after over an hour of work, these three strangers finally helped this woman get out. The woman got out of her car and gave them all a huge hug, and the three men exchanged high fives before they all went their separate ways. Maybe I was the only one that witnessed this act of kindness in its entirety. Maybe those four strangers will never see one another again. But if nothing else, it restores my faith that there really are good, genuine people in this world. I’m an optimist, but I’m not naive to the fact that there are a lot of negative things that surround each and every one of us. But there’s also a lot of positive things happening. It’s those things that we should focus on and share with others. And you never know, sometimes they’re happening right outside your own window. The horrific tragedy that happened in Newtown, C.T. today broke America’s heart. My Facebook, Twitter, Instagram and LinkedIn accounts are flooded with thoughts from my friends and family about the occurrence. Some comments are rooted in anger and disgust. However, most of them are based around this feeling of immediacy — a need to express their appreciation, gratitude and love for the individuals in their life that are still alive and breathing today. Life has a deceptive way of shedding a positive light on reality just moments after a dark and gruesome situation occurs. Maybe that’s the price we pay for living our lives too fast. For having shallow exchanges instead of meaningful conversations. For waving goodbye instead of hugging. For working through lunch instead of enjoying time with your coworkers. So cut the crap already. Life is too uncertain to allow yourself to be indecisive. Embrace someone like you mean it; the kind of embrace where you close your eyes as your arms are wrapped around the other person and you breathe them in before you unwind. Listen to someone when they open up to you. I mean really listen. Don’t start thinking of your response halfway through their sentence and then blurt it out the second they take a breath. Digest what they’re saying and allow it to sink in. You’d want someone to do the same for you. Say what you feel (I’m an obvious advocate of this). Truly. You’ve got to say it. Those words that are on the tip of your tongue. That feeling that is sitting at the pit of your stomach. That instinct that is tearing at your gut. You’ve got to let it out. If for no other reason than you may not have the chance to do it tomorrow. My thoughts and prayers go out to the families and friends of those affected by the tragedy that occurred today in Newtown, C.T. Tell someone at home you love them.